Takasu et al. test the efficiency of long dsDNA plasmids and short ssDNA oligonucleotides for precise genome editing in silkworms. This study follows their previous experiments aimed at inserting GFP into the genome of Bombyx mori using zinc finger nucleases; this time they switched the marker color to red and the engineered nuclease to transcription activator-like effector nucleases (TALENs). Without urate granules, the epidermis of B. mori larvae becomes translucent, giving them an oily appearance. The gene BmBLOS2 serves a crucial role in the formation of these granules, so by choosing this gene as the recognition site for their TALENs, Takasu et al. had a useful phenotype for monitoring TALEN disruption efficiency. Paired with their PCR analysis of pooled larvae from each brood, the efficiency of precise modification of somatic and germline mutations could be observed and quantified. The original impetus of this study was a curiosity about the effect of cleavage site orientation on efficiency of transformation: both dsDNA and ssDNA constructs in the first experiments in this study consisted of constructs aiming to modify the genome either at or beyond the cleavage site via homology directed repair (HDR). While the majority of larvae microinjected with TALENS and dsDNA aiming to knock-in dsRed in BmBLOS2 revealed a hallmark oily appearance from a response to successful double strand breakage by their TALENs, a functional dsRed gene never made it into the germline. In agreement with other studies, they confirmed that circular donor DNA was more efficient for modification than linearized DNA. Attempts to increase HDR efficiency by injecting dsRNA to suppress non-homologous end joining (NHEJ) pathways did not have an impact. However, their efforts to modify the genome using ssDNAs opened some interesting lines of study. It was noted that the plasmid designed to insert beyond the cleavage site had a rate of HDR over ten times higher than the plasmid designed to introduce a modification at the cleavage site. This led the authors to run a series of experiments aiming to understand why this was the case. 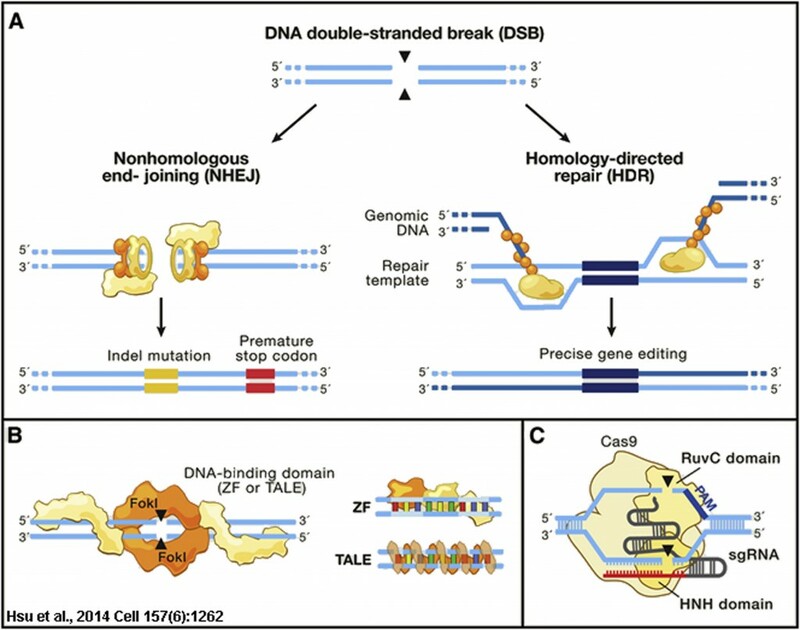 Revealing an intimate understanding of how TALENs direct modification via HDR, the authors indict TALENs themselves for the low levels of precise modification efficiency: by placing their modification in the middle of a TALEN cleavage site, the nuclease will continue to modify the site after incorporation. This resulted in telltale signatures at the insertion site, and the authors confirm this is the case with elegant experiments, each nimbly avoiding TALEN recleavage. The authors also successfully used an ssDNA donor to precisely delete 1.9 kb from the B. mori genome. Throughout this study, Takasu et al. optimize ssDNA donors (including insertion orientation and homology arm length) to increase the efficiency of HDR modification of silkworms in careful experiments in an interesting narrative. Although their efforts still leave knock-in of long stretches of DNA into the germline out of reach, they do point out that it would be feasible to knock in 35 nt stretches using this approach. This fits the bill for two-step knock-in approaches by first inserting a recognition site that can be leveraged for efficient insertion using Cre-loxP recombinase, or perhaps, as a follow up to this article, using the I-SceI homing endonuclease recognition site inserted into silkworms during this study.